The difference was razor-thin between Carey High School and the Dietrich Blue Devils on the stat sheet. The scoreboard at Carey’s Derrick Parke Memorial Field told a different story Friday as the Blue Devils captured a 36-24 football victory. 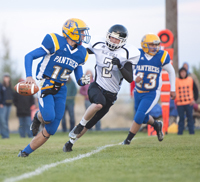 Give much of the credit to Dietrich senior running back Hazen Weber. Weber rushed 32 times for 243 yards and four touchdowns as the Blue Devils (5-0, 2-0 Sawtooth Conference West) kept marching toward an Oct. 25 home date with last year’s State 1A Division 2 runner-up Lighthouse Christian (5-0, 2-0). Kirkland was also impressed with the way his young squad (2 seniors, 5 juniors, 6 sophomores, 9 freshmen) competed on Homecoming Night against a 14-player Blue Devils team (18-3 in its last 21 games) that started all six of its seniors Friday. “It was youth against lots of experience,” said Kirkland. Nonetheless Carey (207 rushing yards) bettered Dietrich 75-56 in number of offensive plays, 28-19 in time of possession and 18-14 in first downs. Dietrich had a 465-418 edge in total yardage, much from Weber (253 all-purpose yards). Dietrich, calling Weber’s number on 32 of its 39 rushes, put together lengthy 81-, 79-, 57-, 80- and 64-yard drives for its five touchdowns. But Carey boasted long drives of its own—80 and 65 yards for first-half scores, and a fine seven-minute 15-play, 73-yard attack that wore down Dietrich in the fourth. The Panthers, trailing 36-12 after Weber’s fourth TD run in the fourth quarter, rallied for two scores in the final two minutes of the eight-man football game making it closer. Leading the way was junior quarterback Nate Adamson (12-for-21, 117 yards, 2 TD passes). His game-high 277 all-purpose yards included 95 rushing yards and two running TDs. Adamson also topped the Panther defense with 12 tackles. Senior Tori Alvarez rushed 14 times for 77 yards, caught four passes for 44 yards and a touchdown, intercepted a pass and returned the ball 31 yards, and recovered an onsides kick that led to Carey’s final score with no time left on the clock. “I thought our team fought valiantly and fought with pride on Homecoming Night,” said Kirkland. “Our front line did a tremendous job of blocking. Our No. 1 goal of the game was to move the ball, keep the ball in our hands and get first downs. And despite the score, we did that—we controlled the ball. Adamson’s 19-yard kickoff return plus his 11-yard and 12-yard pass completions to Joe Parke and Alvarez were big plays on the fourth period scoring drive. Alvarez had a 12-yard rush, and Christian Zarate rushed five times for 18 yards. Carey’s interior offensive line featured junior center Matt Whitworth, junior guard Alex Durtschi and sophomore guard Salvador Ramos. Indeed, Whitworth played four positions—offensive center and guard, tight end (2 pass receptions for 29 yards) and running back in the power-I. After Alvarez’s onsides kick recovery, Carey quickly moved 48 yards to paydirt in the final minute helped by a face mask penalty whistled on a Dietrich defender doing everything possible to stop an Adamson scramble. Alvarez ran 14 yards on 3rd-and-4 and caught a 14-yard aerial on 3rd-and-10. At the buzzer, Adamson found Collin Whitby for a four-yard TD toss. “We’d been off for two weeks, it was Homecoming Night and we came to play to the end. I was pleased,” said Kirkland. Carey (2-2, 0-1 league) will be seeking for its first win in the five-team Sawtooth West when the Castleford Wolves (1-4, 0-2 league, 45.2 ppg defense) visit Parke Field on Friday, Oct. 11. The Wolves have lost to Dietrich 60-26 and Lighthouse 52-6. “We can start looking at the state play-in bracket now, and we’ll definitely need one win in our conference to qualify for those play-in games Nov. 1. It looks like a great opportunity to get that when we play Castleford,” said Kirkland, whose squad also hosts Richfield (2-1, 0-1) on Friday, Oct. 25. Victories over Castleford and Richfield would secure the No. 3 West seed for Carey for the Nov. 1 state play-in week. “Position No. 3 would be fine. We would then play the No. 2 seed from the East, either North Gem or Calvary Chapel,” he said. The way it’s set up this year, the winner of the No. 2 East-No. 3 West game would visit the winner of No. 1 East-No. 4 West in the state quarterfinals. That means, given the relative strength of the West and weakness of the East this year, Dietrich and Lighthouse could meet again in the quarterfinals. North Gem (2-2, 1-0 East) visits Calvary Chapel (1-3, 1-0) Friday, Oct. 4 in Idaho Falls for first place in the Sawtooth East. Dietrich—Aaron Smith, 61-yard pass from Cooper Astle (pass failed); 5:22 1st (6-0 D). Carey—Nate Adamson, 2-yard run (pass failed); 1:41 1st (6-6). Dietrich—Hazen Weber, 6-yard run (Weber run); 9:36 2nd (14-6 D). Dietrich—Hazen Weber, 55-yard run (Weber run); 5:02 2nd (22-6 D). Carey—Tori Alvarez, 12-yard pass from Nate Adamson (run failed); 0:52 2nd (22-12 D). Dietrich—Hazen Weber, 17-yard run (Weber run); 8:04 3rd (30-12 D). Dietrich—Hazen Weber, 14-yard run (run failed); 8:35 4th (36-12 D). Carey—Nate Adamson, 2-yard run (pass failed); 1:09 4th (36-18 D). Carey—Collin Whitby, 4-yard pass from Nate Adamson (run failed); 0:00 4th (36-24 D). Rushing—Nate Adamson 22-95, 4 1sts, 2 TD; Tori Alvarez 14-77, 6 1sts; Christian Zarate 11-37; Joe Parke 1, -2. Passing—Nate Adamson 12-21, 117 yards, 5 1sts, 2 TD. Receiving—Tori Alvarez 4-44, 2 1sts, 1 TD; Joe Parke 3-36, 3 1sts; Matt Whitworth 2-29; Christian Zarate 2-4; Collin Whitby 1-4, 1 TD. Fumble recoveries (1)—Tori Alvarez 1 (onsides kick). Interceptions (1)—Tori Alvarez 1 with a 31-yard return. Sacks (1)—Collin Whitby and Joe Parke 1-2. Tackles (44)—Nate Adamson 12, Joe Parke 8, Matt Whitworth 7, Tori Alvarez 5, Christian Zarate 4, Parker Gamino 3, Toby Whitworth 2, Zach Olsen 2, Collin Whitby 1. Rushing—Hazen Weber 32-243 (7.6 yards per carry), 9 1sts, 4 TD, 3 conv. ; Cooper Astle 4-27; Aaron Smith 2-11; Rashon Norman 1-2. Passing—Cooper Astle 7-13, 163 yards, 5 1sts, 1 interception. Receiving—Aaron Smith 2-103, 1 1st, 1 TD; Vance Perron 2-30, 2 1sts; Chandler Tew 1-20, 1 1st; Hazen Weber 2-10, 1 1st. Kickoff returns—Rashon Norman 1-12; Garrett Astle 1-9. All-purpose yardage—Hazen Weber 253 yards. Fumble recoveries (1)—Rashon Norman 1. Sacks (1)—Austin Fenstermaker and Cooper Astle 1-2. Tackles (82)—Cooper Astle 14, Austin Fenstermaker 14, Rashon Norman 12, Aaron Smith 9, Vance Perron 9, Hazen Weber 8, Chandler Tew 7, Tanner Ward 5, Porter Robertson 2, Garrett Astle 1, Ethan McDaniel 1.